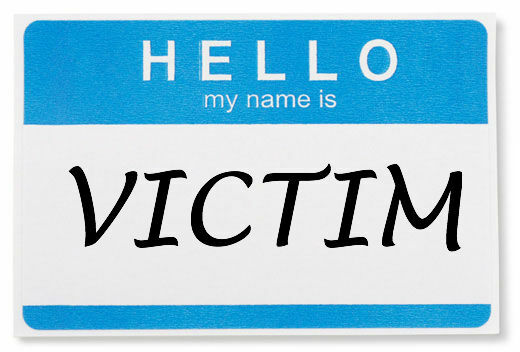 I’ve come to call the “Victim” part of myself “Victimized Vicki”. Victimized Vicki has been with me a long time. She was activated through a lot of modeling that my mother and father did from the time I was very young, as well as my “family story” of being Victims of the Holocaust (as opposed to “Survivors”). Victimized Vicki is always ready, at the drop of a hat, to have me feel bad for myself, to feel like nothing will ever go my way, to have me compare myself with others, and to feel as if I’m fighting a losing battle. When Vicki takes over, I don’t recognize myself at all. I’m at the mercy of her energy and fear. It has been incredibly helpful for me to name my Victim self – naming her and giving her a persona has allowed me to take her out of my blindspot where she feels totally integrated into who I am…and into a separate space for me to be able to see her and recognize her fully. The more I can see Victimized Vicki for who she is, the more I can separate myself from her and stop myself from falling down the Victimized Rabbit Hole. For example — In the scenario where my keys were in the diaper bag and I couldn’t get to the gym — I was able to not give in to my impulses to blame Jon or feel bad about myself and instead, was just able to see that the situation was sucky & annoying…but not really such a big deal in the scheme of things. From there, I decided to make the most of the morning and go for a run in my neighborhood, which turned out to be great because I got to be outside. Because I wasn’t letting Victimized Vicki get in my way, I even saw opportunity when I passed some picnic tables — I used them as a makeshift gym and did arm and leg exercises and stretches with them. The more you can eliminate the Victim from your life and your business, the happier you’ll be. I see the Victim show up when I support my clients sometimes, and she is often a force to be reckoned with, threatening to keep entrepreneurs from moving forward, attracting more clients and wealth, and staying small. –When was the last time your Victim Self showed up? How often does your Victim show up in your life? In your business? –How does your Victim Self act? Who is your Victim Self modeled on? –What are the beliefs that your Victim self tells you? –How can you spot/identify the Victim the next time she wants to come out? Boy is this ever true for me. Even though I have gotten rid of a lot of victimhood thinking. I love the way you told it and easy it was to get trapped in it again. Naming it is brilliant and that is what I am going to do with my thoughts. Just had a great breakfast with my son and grandson and was so proud that I heard these words come out of his mouth when I told him I was signing up for your coaching. “Good for you it is time to start hanging out with better thinkers” Just like you told me. I love all of this Janet! And your grandson is so evolved….just like you! Can’t wait to start working together!